Litter patrols from May to September are weekly sessions. meet at "Writers Corner," Castle Street / St Patricks Ave.
meet at Dillon's Park, Coliemore Road. Litter Patrols carried out in Dalkey. a) Collection of litter took place in Dalkey throughout the year. 1. Castle Street Dalkey each Tuesday at 10.30am and covering the local problem areas. 2. Dillon's Park, Sorrento Park & Coliemore Road, on Thursday's at 11am. 2. Posters were placed on two notice boards in the town. 3. Pulpit announcements from our two local churches and their newsletters. 4. Announcements at any meetings we attended. 5. 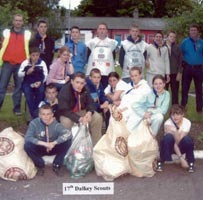 Local clubs were circulated and asked to clean a specific area (cubs, scouts, brownies, Cuala sports, old folks, etc.) with an 80% success rate. + groups of pupils from one of the local schools, coupled with helpers from St. John of Gods. 1. Cigarette ends, mainly outside public houses. 2. From overflowing litterbin's especially following sunny weekends. 3. Drink cans and fast-food packaging, from the car park and places where young people meet in the evenings. 4. Drink cans, bottles, fishing equipment and picnic packaging, even syringes, from Dillon's Park that is on a rocky coast and has wooded areas. lack of time or ability. 2. A small number of local residents usually joined the committee members. 3. We won major awards in local DLRCC competitions. 4. 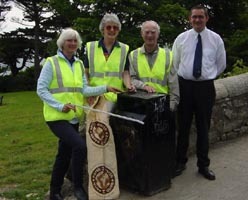 Dalkey Tidy Town's profile was raised considerably. luminous yellow vests we had purchased. Dun Laoghaire Rathdown County Council are very supportive by providing bags, litter pickers, gloves, and special bags for dog excrement. They also pick up the bags from various nominated locations after picking. The Big Belly Rubbish Bins recently installed by DLRCC, appeared to have made a difference around the town. As they are a smart bin, each bin contacts the department to indicate that it needs emptying, saving a lot of manpower & fuel, by not emptying the old ones on a daily bases ( even if they were not full ), also saving the environment by less fuel & associated pollution. In general Dalkey is improving regarding litter, if a slowly at times. A major problem we have is fishermen leaving tangled line with weights & hooks, old fish bait, drink cans & food wrappers, on & around the rocks adjacent to the sea.